This is a week of mourning for President George H.W. Bush. We at the Henry Clay Center join in our fellow Americans as we reflect on the life of service given by this great statesman. We are reminded at every turn, on every outlet, in every conversation about the grace and dedication of our 41st President. We admire the way he guided the ship of state through challenging times, always with a sense of civility. He was principled in his party and acted accordingly. But he was also willing to talk, negotiate, and, if it can be said, compromise with the opposition. Why? 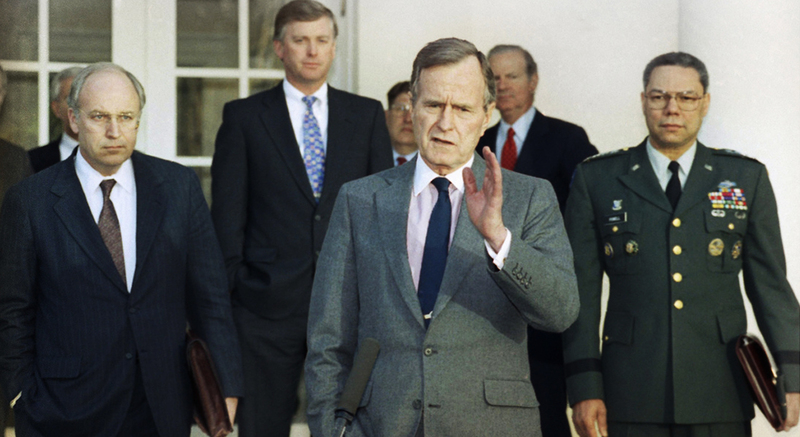 President Bush was able to act in such a manner because he understood the importance of getting it right. His was a higher mission than supporting any one political agenda. His was a mission to further the United States and the ideals which make our country truly exceptional. Perhaps he learned this as a child. Perhaps it was thrust on him in the flak-filled skies of the Pacific. Certainly in combat one learns to surrender his or her agendas to a higher cause. Maybe he learned cooperation in his business ventures. Or it could have been through his years as an elected official, party chairman, diplomat, or intelligence chief. I do not mistrust the future. I do not fear what is ahead. For our problems are large, but our heart is larger. Our challenges are great, but our will is greater. In actuality, it was most likely all of these things. You don’t succeed in these areas without understanding the need to cooperate and find common ground to accomplish a task. As a combat veteran, and a pilot as well, I believe the greatest influence was his experience at war. Defending our nation requires the ability to place aside our surface differences and focus on those things that bring us together. To work as a team regardless of race, gender, creed, religion, or politics.To find common ground in order to survive. So, as we spend this week in remembrance, let us reflect on how President Bush lived his life of service. We mourn his loss, but let us not bury civility with him. Instead of lamenting a “by gone” era of civility in our political discourse, let’s agree to live our lives and conduct ourselves in a manner which he would appreciate. We need to find what we’ve lost. We need to find what he knew. We need to remember how to be Americans and how find our common ground in an effort to survive. This Republic must endure. Our 41st President understood that and lived his life that way. Rest in Peace Mr. President. May we live up to the standards you set.